- Box type platen structure designed through finite element analysis ensures even stress, less deformation, high precision mold clamping & good rigidty. - Optimized tie bar design makes sure stable and speedy movement with less impact. - Lengthened distance between tie bar, mold thickness and opening stroke for bigger mold. - Optimized Lubrication system ensures precise mold clamping and prolonged life time of mold clamping components. - Speedy differential clamping function meet the requirement of special movement. - Movable slide guide-way for hopper, more convenient for material change. - 5 stage injection, 3 stage hold pressure, 3 stage melting control to meet the requirement of different products. - accurate temperature control for material ensures production quality. - Japanese Sumitomo gear pump, high efficiency, low noise, easy maintenance. - Servo system package from famous, manufacturers with unit parameter and standard. - Closed-loop control for pressure and speed, the RPM and the torque can be real-time adjusted, resulting in excellent repeatability. - Ultra high energy saving. 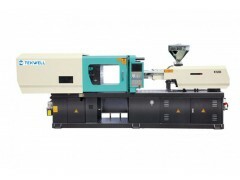 The energy consumption reaches China 1 st grade energy consumption standard of injection molding machine. - High performance redundant power saving design. The power of motor is up to 10% higher than counterpart in the industry, avoiding motor over-heating or auto stop due to insufficiency of power. - SPC quality control/ Superior & inferior product identification and statistical system. - Adoption Ethernet network ensuring speedy connection. - USB interface/SPC data transfer function. - Choice of metric and imperial unit system. - Record of alarm history and parameter function.